It’s very likely that the most imperfect creature God has ever created is man. Animals are, exactly, how they should be. This picture book is a 'canticle' to animal world. 'Playing tag' in thirteen wonderfully drawn plates, words and images allow us to appreciate what surrounds us with new eyes. It's children's eyes observing animals, admiring them: kids would like to possess their qualities, they identify themselves in animals' agility, in their feline spring, in their sharp sight dominating the world. It's children's voices acknowledging themselves into animals, in an identity exchange that brings man back to its instinctual and remote origin. Because the tie children have with nature is deeply rooted and immediate. There is no need of particularly complex explanations: nature, with its mechanisms and cruelties, is perfectly understood and accepted. "Un libro in cui la bellezza non è mai nominata, ma in cui tutto lascia intendere che è ad essa che tende la voce che lo percorre. Un libro-preghiera, per dire che se il pensiero è laico, la natura no. Giovanna Zoboli's writing is supple, dry. It’s an essential language, where there is no space for useless embellishments, where every word stands out in all its possible meanings. Short sentences that re-echo in our minds while eyes get lost in the drawings. Writing is made richer in details and colours by illustrations, that emphasise word’s evocative power. Simona Mulazzani is always able to give her characters particularly intense countenances, these are always central and centred, often characterised by strong pictorial references. I'm thinking for instance at the tiger's image, that reminds me so much of paintings from Le Douanier, Henri Rousseau, with its denser and richer strokes, alternated with lighter touches appeasing an otherwise more dramatic effect. Finding these two artists together, in a new book, is a real pleasure. We're talking here of an artistic couple that is very well consolidated: in the past they received important recognitions such as the Andersen Prize, in 2008, for the Best book in 0-6 category with "Al supermercato degli animali". 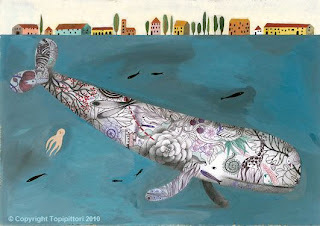 Other famous books by Giovanna Zoboli and Simona Mulazzani are: "Filastrocca ventosa per bambini col fiato corto" and "Anselmo va a scuola", always published by Topipittori. To my opinion, there is another nice new: in fact "Vorrei Avere" will be published contemporarily in several countries. This kind of demonstrates what I was already affirming here regarding the importance of collaboration amid publishing houses. to end with Mexico, for Tecolote Publishing House, even if the book will be available with a few days delay with regard to other countries. Before leaving you I would like to ask: "And you, what would you like to have?" "Il colore della pantera di notte per confondersi nel buio." 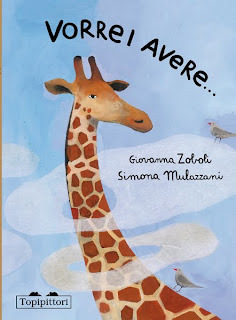 "Vorrei avere", texts by Giovanna Zoboli, illustrations by Simona Mulazzani, Ed. Topipittori, February 2010. A special thank you to Paolo Canton and Giovanna Zoboli for allowing me to publish the images in this post and for the gracious collaboration. Copyright© text and images Topipittori 2010. Images have been reproduced by the permission of the Publishing house. 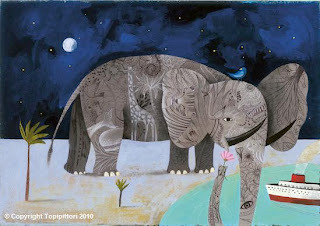 * "Elephant's immense ears to hear what the sky has to say"
** "The whale's voice that sings and can be heard at an ocean's distance"
*** "A book in which beauty is never mentioned, but where everything lets understand that it's toward beauty that the voice crossing this work tends to. A prayer book, to say that if thought is secular, nature isn't. 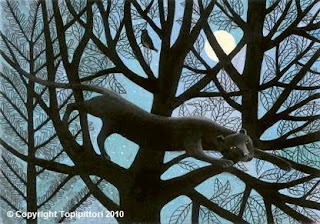 **** "Panther's colour at night to blur in the dark."